These charming mugs bring a bit of nostalgia to your sipping ritual, from morning coffee to bedtime tea. Whether you're inviting the people in your neighborhood or just want to say thank you for being a friend, taking time for a cuppa is always a good idea. 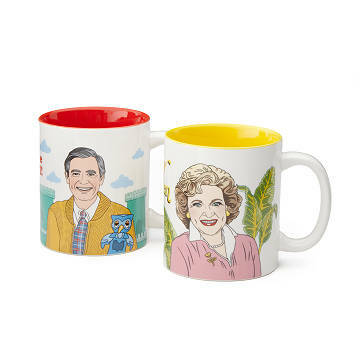 These charming mugs bring a bit of nostalgia to your sipping ritual, from morning coffee to bedtime tea. Give one to the friend who likes both their beverages and their TV buddies to give them the warm and fuzzies. Made in China. 4 Inches High, 10.20" Circumference, 3.25" Diameter; Capacity: 12 fl. oz.